Citywide is responsible for maintaining in excess of 1.5 million trees along Australia's eastern seaboard, and is responsible for planting in excess of 20,000 trees per year for various local government authorities. As caretaker to some of Australia's most iconic open spaces Citywide are always looking for innovative and ecologically sustainable ways to maintain the health of trees, and minimise the impact on the environment. Five years ago Citywide's senior arborists were searching for an efficient method to water and sustain newly planted trees. After trialling a number of technologies, they were found to be unsuccessful due to their inability to conserve water, inadequately assisted water to penetrate to the tree roots, and in some cases lead to greater water consumption and wastage. It was then Citywide discovered Australian product Greenwell. The innovative product made from recycled UV stabilised plastic concentrates up to 26 litres (regular size) and 50 litres (large size) of water around a plant base ensuring all the water applied is made available to the tree roots. 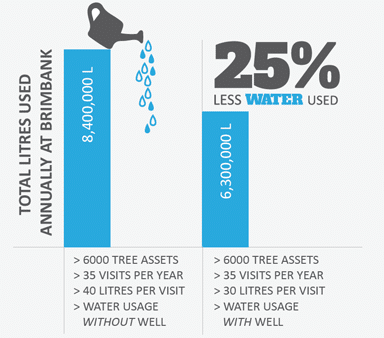 Greenwell ensures newly planted trees receive appropriate amounts of water to the root ball, allowing a considerable reduction in the amount of water used to maintain the trees. It is utilised in colder weather to establish trees, and in warmer weather to assist in watering events. The Greenwell product has not only been identified by Citywide as a leading tree watering innovation, but also by industry being a finalist in the 2010 National Savewater Awards, and accredited by Smart WaterMark, an independent accreditation process to identify and promote water saving products and services in Australia.